We’d love your help. 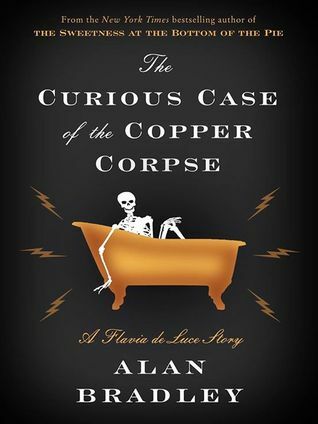 Let us know what’s wrong with this preview of The Curious Case of the Copper Corpse by Alan Bradley. 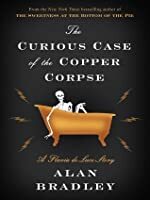 To ask other readers questions about The Curious Case of the Copper Corpse, please sign up. How does the GoodReads community feel about having a Flavia de Luce short ebook to read while waiting for publication of "As Chimney Sweepers Come to Dust" on January 6th? "The Curious Case of the Copper Corpse" is in response to many requests over the years. When would the book be available in the UK? Flavia de Luce has been summoned for an investigation. This is the first time she has been asked to investigate a case. Usually she stumbles upon a corpse and can’t resist the urge to inveigle herself into the situation until she finds the clues that lead to the resolution. She's precocious and frequently finds herself in trouble with the local constabulary as she tries to discover the truth before they do. This is a short story that falls between The Dead in their Vaulted Arches and As Chimney Sweepers Come to Dust. Although after reading it, I’d say a fan would be fine reading it at any time within the series. It is always a pleasure to spend some time with my favorite girl detective. When you just need to touch base with the young lady, this short story will do nicely. Fun to read if you like Flavia de Luce, but the problem I see about this very short story is that the crime isn't that bloody interesting and the ending a letdown. But Flavia is Flavia, sometimes I forget that she is only 11-years old. But she is so smart and her thoughts in this short story, how she solved the case etc. is the things that make it readable. She is just so...precocious! First Sentence: I was peering through the microscope at the tooth of an adder I had captured behind the coach house that very morning after church, when there came a light knock at the laboratory door. It’s not every day Flavia is summoned to her father’s old school. Upon arriving, she finds a terrified boy and a bathtub containing a naked man covered in copper. It’s time for Flavia to get to work. Bradley’s wonderful descriptions and excellent dialogue explain exactly why one can’t help but love First Sentence: I was peering through the microscope at the tooth of an adder I had captured behind the coach house that very morning after church, when there came a light knock at the laboratory door. Bradley’s wonderful descriptions and excellent dialogue explain exactly why one can’t help but love Flavia. From her anthropomorphism of her bicycle, to her brilliance and logic, there is something truly wonderful about this character. She may be a fictional character, but Flavia represents that to which a young girl can aspire…without the poisons and bodies, however. “The Curious Case of the Copper Corpse” is a delightful, perfect amuse bouche until the next full installment of Flavia is available. I miss my little friend when she's not available...so this short story was fun to read. I'm actually not much of a short story fan, but I find that when they related to characters I've already developed a fondness for, then it's sort of like having a small dessert every now and again. This time, Flavia has been summoned from a student at the boy's school. Murder has already been done, but who is it? Can Flavia figure out the case and avoid getting caught? Since trouble tends to follow her like a I miss my little friend when she's not available...so this short story was fun to read. I'm actually not much of a short story fan, but I find that when they related to characters I've already developed a fondness for, then it's sort of like having a small dessert every now and again. This time, Flavia has been summoned from a student at the boy's school. Murder has already been done, but who is it? Can Flavia figure out the case and avoid getting caught? Since trouble tends to follow her like a shadow on a particularly sunny day, it's hard to imagine a successful end to the venture - but you'll just have to read on! This is an escapade of Flavia spending an hour or two in the local Boys' School due to emergency note implications for seeking "HELP". It's highly enjoyable if you have read the series and know the full context to Flavia's chemistry summations. It reminded me of Sherlock in his deductions from personal clothing or scuffs on the pants' legs to event origination. This is what a short story should be, IMHO. And I disagree completely that this didn't give enough depth to Flavia's character and onus This is an escapade of Flavia spending an hour or two in the local Boys' School due to emergency note implications for seeking "HELP". It's highly enjoyable if you have read the series and know the full context to Flavia's chemistry summations. It reminded me of Sherlock in his deductions from personal clothing or scuffs on the pants' legs to event origination. This is what a short story should be, IMHO. And I disagree completely that this didn't give enough depth to Flavia's character and onus "on the whole". In fact, I think for the length and the occurrence described, it gave a nearly perfect "window". Netterweise kriegt man auch mal was für 0 EUR bei Amazon angeboten. Und netterweise gehört es zu einer Reihe, die man sowieso gerne liest. Einziger Nachteil hierbei: Kurzgeschichten sind viel zu kurz. Second Read: My hubby is a HUGE Flavia de Luce fan. So I took a copy of this story with us on our travels, and read it aloud so we could both enjoy it. It was a lot of fun to read with him. This was a rather short story. It takes advantage of the fact that most people are already going to be familiar with Flavia and her surroundings and gets right to the point. It was interesting that Flavia's reputation has led her to be consulted in a murder mystery, and the murder mystery itself was a little Second Read: My hubby is a HUGE Flavia de Luce fan. So I took a copy of this story with us on our travels, and read it aloud so we could both enjoy it. It was a lot of fun to read with him. This was a rather short story. It takes advantage of the fact that most people are already going to be familiar with Flavia and her surroundings and gets right to the point. It was interesting that Flavia's reputation has led her to be consulted in a murder mystery, and the murder mystery itself was a little weird. The pacing was fast, the suspects were lined up in front of us, and after a bit of snooping Flavia puts it all together and confronts the person who needs to be confronted, solving the mystery. There wasn't much meat to this story, but it was a nice snippet during the long wait for the next novel in the series. I'm hoping Alan Bradley took his time with the next book and made it a good one. First Read: I had an opportunity to visit an old friend today. Been a long long time since reading a Flavia de Luce book, did so and was highly rewarded. I forgot how fun they are, and our corpse was found in the bathtub with blue "stuff" all around him later determined to be copper sulfate. The solving is handled real cute and this is more of a novella than a regular full length book. Still fun to read and enjoy. Don't want to be a spoiler, but I definitely recommend and I will also get back on track and enjoy the ones I haven't read yet. ENJOY!!! How did I not know about this story?! Delightful Flava as always. I love her so much! This is obviously a very short story (27 pages) and therefore doesn’t have the same detail as his other stories, but it still has that feel of unique quirkiness and charm that comes from a wonderful lead and side characters. I found the mystery to be intriguing and I can’t wait to pick up Bradley’s newest that came out earlier this year! Happened to pick this up on a whim after seeing a review by a fellow GR member. Loved the artwork and idea of it better than the book itself, although it wasn’t horrible. I’m guessing I would have liked it a lot more if I’d been previously familiar with the series. Not the best book to jump in on—as with many short stories—it left me wanting more details and context. Quick, like 30 minutes quick, read of Flavia being Flavia. "“I’m sorry,” Plaxton whispered, averting his eyes. “This is probably no place for a girl.” “Girl be blowed!” I snapped. “I’m here as a brain, not as a female.”"
Flavia de Luce is in her favorite spot, her chemistry lab, when a note arrives at the hands of Dogger, proclaiming Murder! and asking that she come immediately to Anson House, the boy’s school which her father attended in his younger days. Never one to resist a mystery, or a dead body, Flavia summons Gladys and sets off immediately. Upon her arrival she discovers a corpse in a bathtub and a very upset young boy. Will she solve the mystery before the body is discovered by the authorities? This is Fla Flavia de Luce is in her favorite spot, her chemistry lab, when a note arrives at the hands of Dogger, proclaiming Murder! and asking that she come immediately to Anson House, the boy’s school which her father attended in his younger days. This is Flavia de Luce we are talking about. Alan Bradley’s short story, featuring the beloved young sleuth, was released today and it is a nice little appetizer to consume while waiting for the newest novel, As Chimney Sweepers Come to Dust, due for release on January 6th. The Curious Case of the Copper Corpse is a short story, emphasis on short. I suspect Amazon’s website will soon be flooded with low-star reviews complaining about paying 99 cents for a story that can be read in 15-20 minutes. These complaints always annoy me, simply because they often come off as if the person didn’t bother to read the description of the product, which clearly states it is a short story. I can accept that it is valid to discuss value for output when it comes to purchase prices for short fiction, we all have our own opinions about the value of short fiction, but it is not okay, in my book, to be an irresponsible consumer, purchase something without carefully reading the description, and then complain as if you were ripped off. I will eschew any further detailed discussion of the story itself as it truly is a short work and it would be heartless of me to ruin it for Flavia fans. Suffice it to say that it is a Flavia story. All the hallmarks of what make Flavia de Luce’s adventures so engaging are here. Do they work as effectively in a short story? Yes and no. Of necessity the mystery wraps up quickly, but then again Bradley gives us a mystery which fits well with a quick solution. But it is so fitting with who Flavia is that she would be present if a dead body in odd circumstances turned up in her village. I was thrilled to see Gladys have a small part in the story. She is certainly one of my favorite non-human characters in fiction, and by far my favorite bicycle. A very very short short story. I love Flavia, the books about her belongt to my favourites but I don't think she fits into a short story. It was okay, Flavia is nifty as always, the story is a bit macabre as always and she solves the case with her chemical knowledge as always. But it felt a bit unnatural to read it because it all seemed to be a bit rushed. And - at least to me - the solution to the case was pretty obvious right from the beginning because such a short story just doesn't permit eno A very very short short story. I love Flavia, the books about her belongt to my favourites but I don't think she fits into a short story. It was okay, Flavia is nifty as always, the story is a bit macabre as always and she solves the case with her chemical knowledge as always. But it felt a bit unnatural to read it because it all seemed to be a bit rushed. And - at least to me - the solution to the case was pretty obvious right from the beginning because such a short story just doesn't permit enough turns of events and new characters that you get to know. Flavia de Luce is a wonderful character, a 11-year old amateur sleuth who is also quite a skilled young chemist. This series is set in the English countryside in the 1950's. Flavia is a very precocious and intelligent child who is at constant battle with her two older sisters. This publication is a short story where Flavia is called to a boy's school in order to investigate the dead body of a teacher. If you've been curious about this series but didn't want to invest in reading a whole novel, thi Flavia de Luce is a wonderful character, a 11-year old amateur sleuth who is also quite a skilled young chemist. This series is set in the English countryside in the 1950's. Flavia is a very precocious and intelligent child who is at constant battle with her two older sisters. This publication is a short story where Flavia is called to a boy's school in order to investigate the dead body of a teacher. This is a very short short story starring everyone's favorite 11-year-old poisons expert, Flavia de Luce. A student at the local boys' academy calls on Flavia to investigate a very unique murder. The details of the death are interesting, but the case is resolved quite quickly. There is a nice use of language here and there, like a knife used for "crumpets and correspondence," and Flavia's brusque attitude is always good for a laugh. "I needed to take it easy on this boy. He was, after all, not mu This is a very short short story starring everyone's favorite 11-year-old poisons expert, Flavia de Luce. A student at the local boys' academy calls on Flavia to investigate a very unique murder. The details of the death are interesting, but the case is resolved quite quickly. There is a nice use of language here and there, like a knife used for "crumpets and correspondence," and Flavia's brusque attitude is always good for a laugh. "I needed to take it easy on this boy. He was, after all, not much older than me. 'Where's the corpse?' I asked." That's Flavia's idea of taking it easy. Tratto da una raccolta di gialli ambientati a scuola, questo racconto breve non è riuscito ad appassionarmi neanche un po’. Quanta differenza con i precedenti romanzi della serie di Flavia de Luce! Anche la trama sembra forzata e confusionaria, forse per provare a condensare un insolito delitto in poche pagine. Evitabilissimo, anche per gli irriducibili appassionati della serie.